I don’t buy a lot of souvenirs when I travel, but the prospect of bargaining in Istanbul sounded like too much fun. I hoped to negotiate in Turkish (to give myself some legitimacy) and so I really tried to learn at least how to say numbers. Frankly, I doubt I fooled anyone and you’ll see that only one purchase was actually significantly made in Turkish. That being said, I’m really happy with what we found. Eating shish kabob every other day, I decided I needed some meat skewers so I could make them myself at home. 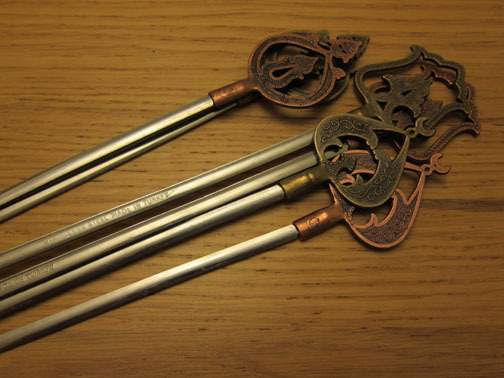 Walking through the Spice Market, I saw a sign that skewers were 2 TL each, but they had cow, chicken and pig handles that I didn’t like. I walked on to a hardware/kitchen store which had some with more Ottoman designs and picked out 6 total. In my best Turkish I asked, “Hello. Six, how much?” The young man thought and said 9 TL. (Thankfully I know what the number 9 is in Turkish; otherwise I would have just stared blankly and would have had to revert to English.) My husband claims that it sounded like I was offering 6 TL and not asking how much 6 skewers were. In that case, I am much better at bargaining than I thought! Anyways, 9TL (~$4.5) sounded like a good deal compared to the sign I saw earlier, so I bought them. Later in the Grand Bazaar, I saw the same skewers for 5 TL each! Granted that included a tourist premium but it definitely made me feel good about my purchase. Passing another kitchen shop, my husband decided he wanted the special knife designed to cut Turkish Delight (or lokum). We’d seen it in use earlier and he remarked how interesting it was. 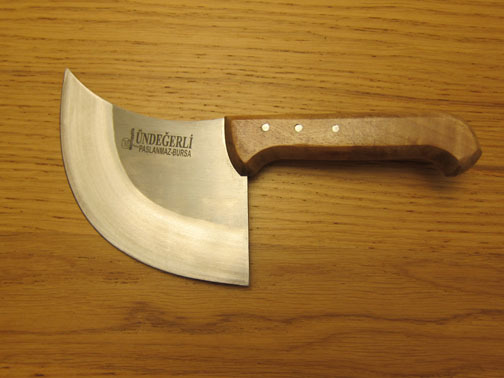 I think it looks like an Alaskan Ulu with a better handle. The shop owner initially said the knife was 25TL but we got it down to 18TL, albeit in English. I’m not sure what I am going to cut with our lokum knife but it is handmade and really beautifully designed so we may just display it. 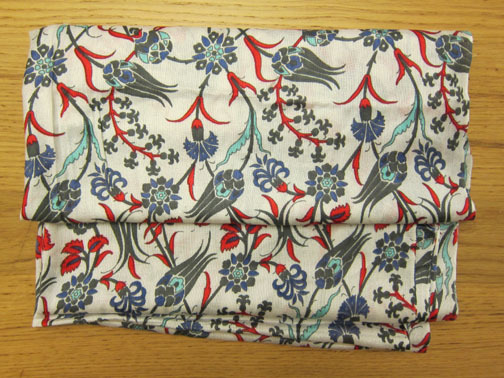 Back at the Grand Bazaar, I found a thin cotton scarf printed with the same floral Iznik tile design of the Blue Mosque. Given that most shops in the Bazaar sell the same things, this was a nice find. The shop owner was dealing with a loud English-speaking woman who, while clearly interested in the shop, made the mistake of saying “I only have $100 to spend”. I asked about the scarf and the owner said it was 25TL. I started complaining that it wasn’t very thick and it was only cotton, and then offered 15TL. “Okay fine,” he said smiling while still trying to distract the other customer. Maybe I could have bargained more, but I was fine with that price and at least I walked away without spending $100.